Outfitting work was completed on China's first domestically built aircraft carrier, Type 001A, on Thursday, making the ship ready for its second sea trial. The carrier's first sea trial was from May 13 to 18. A military expert said this proves the first sea trial was successful, and that the process could be accelerated. 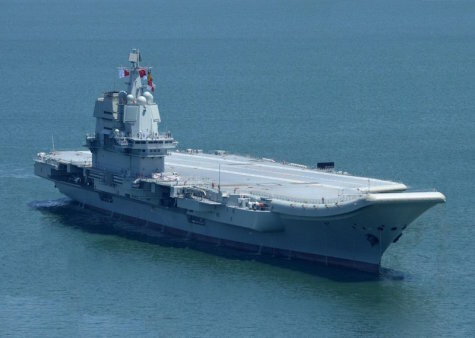 After a five-day sea trial, the carrier returned on May 23 to the Dalian Shipyard, Northeast China's Liaoning Province, to finish its remaining outfitting work. A report from wenweipo.com said the carrier has been moved out from the dock and is ready for its second sea trial. "The carrier's surface doesn't show any big changes, and the outfitting work is primarily for inspection and maintenance. After the first sea trial, the ship's instruments collected data and information, so its equipment must be adjusted based on the data," said Song Zhongping, a military expert and TV commentator. "The carrier can be delivered to the People's Liberation Army (PLA) Navy as soon as possible," Song added. Although China already has one aircraft carrier, the Liaoning, in service, it doesn't mean the second one can skip steps during the sea trials, Song told the Global Times. "The Liaoning helps China gain experience in testing a huge warship like an aircraft carrier, so it can accelerate the progress for the next one, but progress has to be made step by step." The first sea trial results for the ship, known as the Type 001A, have been successful, China Shipbuilding Industry Corporation (CSIC) Chairman Hu Wenming said on June 21, according to the company's official website. The PLA used to lack air supremacy in the South China Sea and on the high seas, Song said, adding that the aircraft carrier could help overcome the shortcoming. The ship is China's second aircraft carrier after the Liaoning, and its construction began in 2013, People's Daily website people.cn reported.